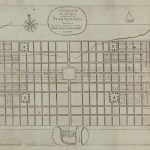 Thomas Holme (1624-95) surveyed what would later be known as Center City at the request of William Penn (1644-1718), creating a river-to-river grid layout with five public squares. Penn hoped development would occur simultaneously along both the Schuylkill (shown on the left side of this map) and Delaware River waterfronts, and along High (Market) Street. The Great Fire of London, which ravaged that city in 1666, inspired Holme to create wider streets, larger land parcels, and plenty of open spaces to prevent a potentially deadly fire from engulfing the city. In practice, development was densely concentrated along the Delaware for most of the city’s early history. This is the first map of the city plan, drawn by Holme and published in London in 1683. During the Colonial Era, Philadelphia served as the seat of Pennsylvania’s provincial government and home to the Pennsylvania State House, later renamed Independence Hall. After the state government moved to Harrisburg, the hall housed Charles Willson Peale’s natural history museum and almost faced demolition; the wooden steeple and two wings were removed before the state sold the structure to the city in 1816. 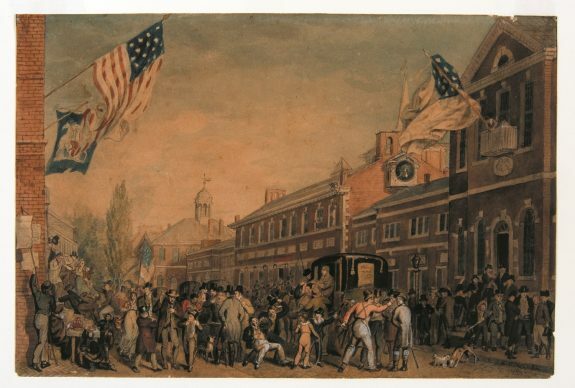 This scene by John Lewis Krimmel (1786-1821) shows an election day crowd in 1815, with the steeple-less State House in the background and Congress Hall, seat of the United States Congress from 1790 to 1800, in the foreground. Both buildings were incorporated into Independence National Historical Park after its founding 1948. While this park and its mall preserved a number of the city’s early civic buildings, its construction led to the demolition of much of the surrounding neighborhood, including office buildings, factories, and part of “Bankers Row,” and transformed the area from a business district to a tourist destination. 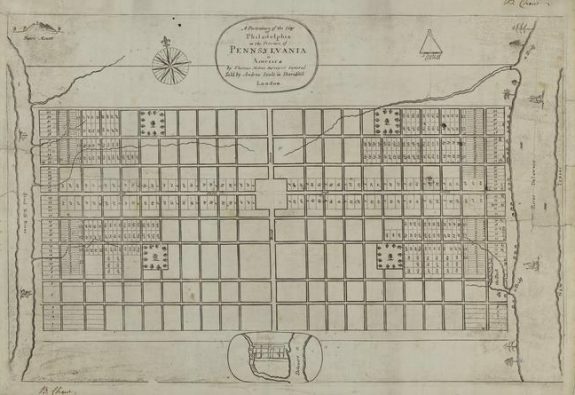 William Penn’s original plan for Philadelphia included five public squares: Northeast (Fitler), Southeast (Washington), Southwest (Rittenhouse), and Northwest (Logan) surrounding Center (Penn) square. Penn hoped that Center Square would become the heart of Philadelphia’s civic realm, and in 1870 this goal was finally realized when a referendum selected it as the site of the new City Hall. But prior to that, Center Square acted as home to a pump house designed by Benjamin Latrobe (1764–1820) between 1801 and 1829 that supplied water to the city through a gravity-fed system from the Schuylkill. 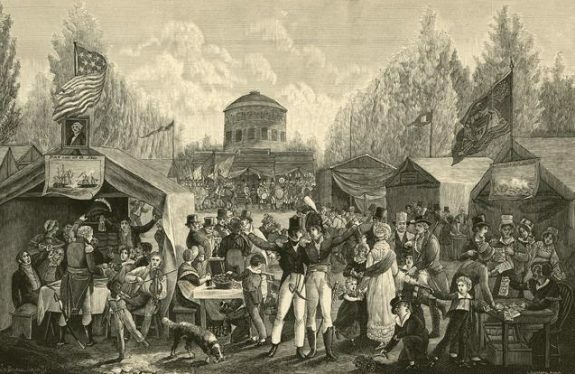 The pump house serves as the background for this 1819 sketch by John Lewis Krimmel (1786-1821) depicting a raucous Fourth of July celebration. 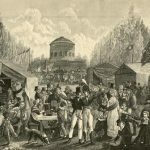 In keeping with the city’s namesake as the City of Brotherly Love, the crowd in Krimmel’s drawing spans the city’s demographics, with young and old men and women, children, African-Americans, people in Quaker attire and elaborate military costumes all celebrating communally. 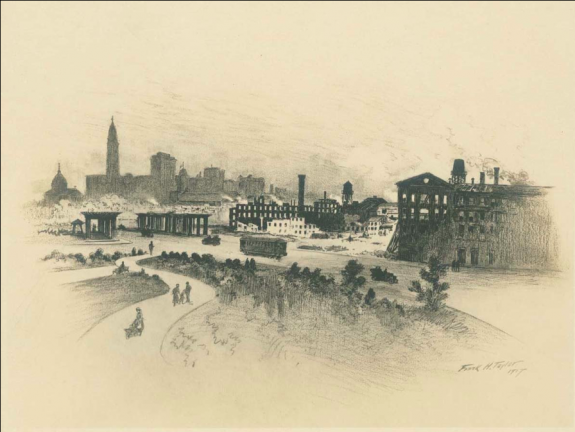 By the mid-nineteenth century, the city had expanded westward from the Delaware River waterfront, although development on the Schuylkill River remained largely industrial. This 1857 map, drawn from the west bank of the Schuylkill, shows the city’s first gas works and factories on the east bank. The denser residential and commercial areas were still concentrated east of Broad Street. By the end of the century, mass transportation systems like streetcars helped shift residential development west and north by allowing people to commute easily from their homes to work. Although nineteenth and twentieth-century civic leaders promoted the city as an attraction for convention-goers and other visitors, they downplayed the city’s more unseemly sections. The tenderloin or “vice” district and “furnished room” district developed around Ninth and Race Streets. and along Vine Street., east of North Broad. These areas, home to a concentration of brothels, nightclubs, bars, gambling, and drugs, which emerged in the nineteenth century and flourished in the twentieth century, were tolerated, if not openly supported by surrounding residents and City officials until late twentieth-century century clean-up campaigns and shifts in demographics diminished their reputation as dens of iniquity. 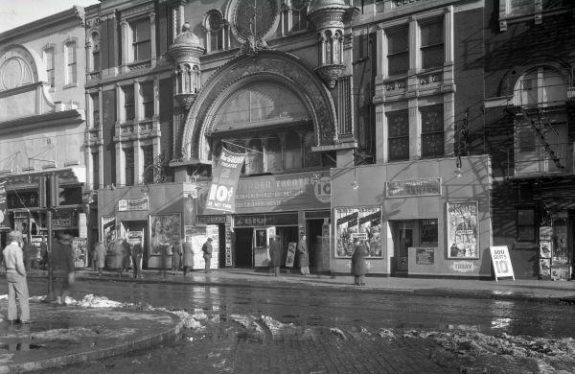 This 1938 photograph shows the Auditorium Theater (left) and New Garden Theater, two of the many entertainment venues that lined N. Eighth Street in the first half of the twentieth century. Many of these theaters promoted burlesque, minstrel shows, and other less-than-reputable entertainment. The Pennsylvania Railroad’s Broad Street Station provided passenger service from the suburbs to Center City and the growing Broad Street cultural corridor beginning in 1881. Trains came into the heart of the city on elevated viaducts, most notably the Pennsylvania Railroad tracks that ran from the Schuylkill River to the Broad Street Station along Filbert Street, bridging the numbered streets along the way. Later known as the “Chinese Wall,” the viaduct rendered the area north toward Logan Square far less desirable than the area to the south, which was already anchored by fashionable Rittenhouse Square. The Benjamin Franklin Parkway, completed in 1918, provided Center City with a new cultural corridor in its northwest quadrant and allowed easy passage to Fairmount Park. Construction required the demolition of over 1,300 buildings. Among these was the Medico-Chirurgical College, shown to the left of this 1917 drawing by Frank H. Taylor (1846-1927), which was dismantled piecemeal leaving just a columned entryway standing until that, too, fell to the wrecking ball. The Cathedral Basilica of Saints Peter and Paul, completed in 1864, was one of the few buildings along the Parkway corridor that was spared. 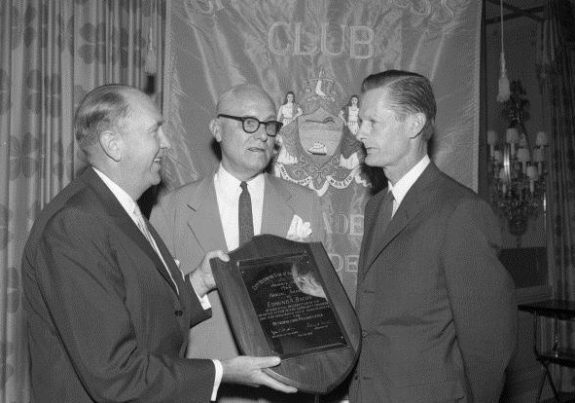 The mid-twentieth century brought a wave of massive redevelopment projects to improve areas of the Center City district deemed “blighted.” Many of these efforts were spearheaded by city planner Edmund “Ed” Bacon (1910-2005), shown right, receiving an award from the Center City Business Men’s Association in 1962. Bacon led the Philadelphia City Planning Commission from 1949 until 1970. Some of his major projects include construction of I-95, the revitalization of the city’s Society Hill neighborhood, Penn’s Landing, and the Mall in Independence National Historical Park. 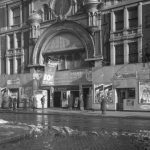 These efforts helped change the image of Philadelphia in the late twentieth century, but also displaced residents and demolished much of the city’s nineteenth-century architecture. Highway construction eventually cut the district off from the Delaware River waterfront. The Act of Consolidation of 1854 doubled the population of Philadelphia and necessitated the construction of a new City Hall to replace the one at Fifth and Chestnut Streets, near Independence Hall. Center (Penn) Square, at the intersection of Broad and Market Streets was controversially chosen as the site of this new civic center in 1871. 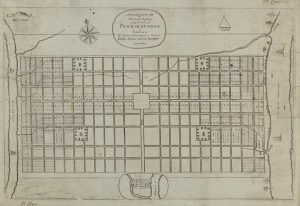 Though it was William Penn’s original intention that this square be the heart of Philadelphia’s civic life, the city was still concentrated along the Delaware River waterfront; Center Square was considerably west of the city’s commercial, political, and residential districts. After a prolonged construction period the monumental Second Empire-style building— featuring a 37-foot bronze statue of Penn atop its central clock tower— was completed in 1901. A “gentleman’s agreement” that construction in the city should not exceed the height of the Penn statue remained in place and determined construction patterns in Center City for nearly a century, until it was broken by One Liberty Place in 1987. Mid-twentieth century plans to demolish the massive structure to facilitate automobile traffic along Market and Broad Streets were abandoned when it was determined that, due to the solid masonry construction with load-bearing walls up to twenty-two feet thick, the demolition would bankrupt the city. It was added to the National Register of Historic Places in 1976. In the 1870s, a small but bustling Chinatown began to develop in the area between Arch and Vine and Eighth and Thirteenth Streets and became home as well to Korean, Indonesian, and Vietnamese populations. Chinatown residents formed strong associations and neighborhood groups that staved off multiple attempts to raze or relocate their neighborhood in the name of civic improvement and development. In recent years, neighborhood associations have successfully fought off attempts to build a casino or a sports stadium within Chinatown. 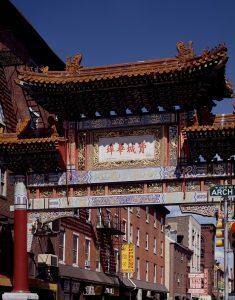 The Friendship Gate at Tenth and Arch Streets was built in the 1980s as part of a sister cities program with the city of Tianjin and has become a major landmark in the neighborhood. The gate was constructed by engineers and artisans from Tianjin under the guidance of local architect Sabrina Soong (1934-2006). Forming a core of civic, commercial, and residential life since Philadelphia’s seventeenth-century founding, Center City has been a continually evolving experiment in urban living and management. The roughly rectangular area of about 2.3 square miles between the Delaware and Schuylkill Rivers, from Vine Street to South Street, occupies the territory of the original 1682 city plan for Philadelphia. Once a forested expanse with hills, ponds, and streams, the land between the rivers transformed over time into a populated grid where residential and commercial interests jostled, shifted, and spread from east to west to fill in the footprint of “the city proper.” Rivers, roads, and later railroads, public transit, and highways linked the city with the wider region, making the urban core a hub for people, culture, and commerce—but also making it possible for residents and businesses to move to outlying neighborhoods and suburbs. In the twentieth century, new generations of city planners mobilized to combat the effects of suburbanization and revitalize Center City as a place where residents and visitors could live, work, and play. Surveyor Thomas Holme (1624-95) and founder William Penn (1644-1718) conceived the idea for a gridded city punctuated by garden squares in the 1680s. They drew inspiration from baroque town planning, post-Great London fire (1666) concerns for city health, desires to compensate initial investors in Pennsylvania with land, and personal preferences of Penn and early interest groups such as the Free Society of Traders. The plan drawn by Holme intended settlement to occur on both the Schuylkill and Delaware waterfronts and along the main streets of High (later Market) and Broad. After the first printing of the plan in 1683, the river-to-river grid appeared prominently on maps of Pennsylvania, but creating a city in the image of Penn and Holme’s plan required nearly two centuries of clearing trees, leveling land, extending streets, and building upon the grid. Early settlement focused on the Delaware waterfront, which became the main site of commercial and residential building and growth during the colonial era. 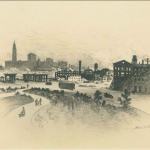 While property at the city plan’s western edge, on the Schuylkill, remained relatively open with scattered farms and industrial workshops, the Delaware riverfront grew with wharves, warehouses, churches, taverns, and houses. Settlement hugged the Delaware shore in a semi-crescent shape, most densely along High Street and thinning to the north and south. More and more residents clustered into the area by subdividing lots. Residences of the most prosperous Philadelphians faced the main streets while smaller houses on back alleys and courts filled with laborers and the poor. Instead of civic buildings on a center square, as Penn and Holme had planned, by the 1720s a town hall and Quaker meetinghouse anchored the city at Second and High Streets. Construction of the Pennsylvania State House (Independence Hall) in the 1730s pulled the city westward to around Fifth Street, but as late as the 1790s, Thomas Jefferson (1743-1826) received advice to rent quarters east of Seventh Street because “so few houses” stood farther west. The port on the Delaware, ferries from New Jersey, and roads radiating outward into Pennsylvania, Delaware, and Maryland enabled people and goods to move in and out of the compact city. Throughout the colonial era English, Irish, Scots-Irish, Welsh, German, and free and enslaved people of African heritage came through the port of Philadelphia to build and settle the city and surrounding region, which had been occupied earlier by Native American camps and Swedish settlements. From nearby hinterlands and across the Delaware River from New Jersey, agricultural products came to the High Street market and shipped out to other colonies and the world. The presence of the market, which extended to the west as the city grew, gave High Street of the original city plan a new name: Market Street (informally at first, made official in 1858). The settled area of the city extended to Seventh Street by 1790, and by 1800 the forest had been cleared from river to river. In the decades following the American Revolution, as property values closest to commercial High Street increased, the settled area of Philadelphia became more segregated by economic status. The laboring class and the poor migrated in greater concentrations to low-rent districts at the southern and northern fringe, including a notoriously bawdy area known as “Helltown” north of Arch Street between Third Street and the Delaware River. Beginning in the 1790s and continuing into the early nineteenth century, a significant free African American neighborhood grew at Sixth and Lombard Streets, around Mother Bethel AME Church. African Americans also clustered in the area north of Arch Street and west of Fourth. A German neighborhood formed on the city’s northern border, and French immigrants who arrived during the French and Haitian revolutions opened businesses in the vicinity of Second and Walnut. 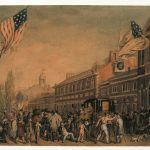 Philadelphians of the late eighteenth and early nineteenth century made choices that imposed order and shaped the look and feel of the city proper for centuries to come. In 1795, city officials banned wood-frame buildings from inside the city limits, which assured that the fine rows of new homes built in the early decades of the nineteenth century would be made of red brick, often with marble-front raised basements and steps. The city government also looked back to the original city plan to guide improvements of the neglected public squares. Between 1801 and 1829 the center square, which Penn and Holme had intended for public buildings, became home to a neoclassical pump house that architect Benjamin Latrobe (1764-1820) designed to supply water to the city via a gravity-fed system from the Schuylkill. In 1825 the City Councils gave the squares new names that imprinted history in the landscape: Washington (for the southeast square), Franklin (northeast), Rittenhouse (southwest), Logan (northwest), and Penn (in the center). Washington and Franklin squares transformed during the 1820s and 1830s from neglected plots and sometime burial grounds into landscaped parks. Rittenhouse and Logan squares similarly improved during the 1840s and 1850s, as the population spread west. Rittenhouse Square became an especially prime address as lands west of Broad Street began to fill with row houses, new houses of worship, schools, and businesses during the 1850s and 1860s. While residents and businesses planted new structures across the width of the grid, earlier settled blocks churned with changing purposes and redevelopment. The Merchants Exchange completed in 1834 at Third and Walnut Streets signaled the continuing importance of maritime commerce, as did the 1830s rebuilding of a warehouse district on Front Street north of Market Street and the creation of the waterfront Delaware Avenue, funded by a bequest of merchant Stephen Girard (1750-1831). However, businesses also moved inland from the waterfront and formed specialized clusters for banking, insurance, and publishing. In the oldest sections of the city proper, many colonial-era homes survived but deteriorated into subdivided multiple-family dwellings or industrial workshops. Homes associated with the nation’s founders gave way to commercial buildings on High Street, and factories replaced brick houses on Arch and Cherry Streets. Philadelphians built over cemeteries and turned streams into underground sewers. The relationship of the city proper with outlying areas changed fundamentally from the 1830s through the 1850s, first with the expansion of public transportation networks and then with the Consolidation Act of 1854. Railroads, omnibuses, and horse-drawn streetcars allowed increasing numbers of Philadelphians to move beyond the boundaries of the original “walking city.” The Consolidation Act extended the city’s boundaries to encompass all of Philadelphia County, but in doing so it reduced the old city proper into a nameless section of a larger whole. “Old city proper” lingered as a name for the central city, remaining in use as late as the 1920s. However, by the late nineteenth and early centuries “center city” (or “centre city”) appeared frequently in newspaper advertisements for real estate and employment, suggesting a widespread understanding of the phrase as a designation for Philadelphia’s downtown. During the 1920s and 1930s, Center City (sometimes capitalized and sometimes not) became more common as a place name in advertising, in the names of buildings, and in city government communication. Thereafter, embraced by city planners as well as organizations such as the Center City Residents Association (formed in 1947), Center City dominated as the name for the old city proper. Following consolidation, Philadelphians made another pivotal decision for the future shape and functions of the central city when they selected Penn (or Center) Square, the site Penn and Holme had intended for public buildings, as the location for a new City Hall. The site at Broad and Market Streets, determined by referendum in 1870 after years of debate, followed the westward trend of the city away from the traditional home of municipal government on Independence Square. By the time voters chose Penn Square over Washington Square, substantial development had occurred on Broad Street, including construction of the Academy of Music (opened in 1857) and fine hotels on South Broad and development of business and industry to the north. Anticipation of the new City Hall, which took form between 1871 and 1901, spurred additional nearby development. The Pennsylvania Railroad and Reading Railroad opened massive new stations on Market Street flanking Penn Square (Broad Street Station, built 1880-82 and expanded 1892-94 at Fifteenth Street, and the Reading Terminal, built 1891-93 at Twelfth Street). Adding to Broad Street’s status as a cultural corridor, the Pennsylvania Academy of the Fine Arts moved to its new building designed by Frank Furness (1839-1912) in 1876. The same year, as Philadelphia celebrated the nation’s centennial, John Wanamaker (1838-1922) opened his “Grand Depot” store in the former Pennsylvania Railroad Freight Depot at Thirteenth and Market Street, heralding an era when large department stores drew crowds of shoppers from the city and surrounding areas to an increasingly bustling and diverse downtown. Older blocks continued to lose their cachet but served as points of entry for immigrants and other new arrivals to Philadelphia. 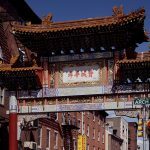 Beginning in the 1870s, a Chinatown began to form in the 900 block of Race Street as Chinese merchants and laundrymen migrated to Philadelphia from the West Coast. With few options, the Chinese created their community in the midst of a vice district known as the Tenderloin, north of Race Street between Sixth and Thirteenth Streets. In the remnants of the colonial city near the Delaware River, refugees from pogroms in Russia created a Jewish Quarter beginning in the 1880s. African Americans migrating from the South to escape repressive Jim Crow conditions extended the historically black neighborhood around Mother Bethel AME Church westward toward Broad Street and beyond. In the northwest quadrant of Center City, meanwhile, the new City Hall helped to fuel imagination of a grand new boulevard extending northwest to link the center of the city with Fairmount Park. Plans formed slowly but came to fruition with the opening of the Benjamin Franklin Parkway in 1918. 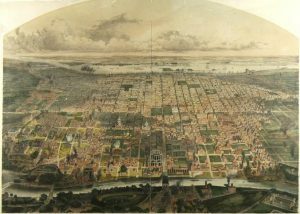 The civic improvement gave Philadelphia an expansive new avenue in the style of Paris and spurred development of a new cultural district around Logan Square (which became a traffic circle). In the process, the city demolished 1,300 residential and industrial properties but spared the Cathedral Basilica of Saints Peter and Paul, which had faced Logan Square since 1846. Although the urban core remained in part residential, by the early the twentieth century commerce and culture firmly dominated the landscape and the skyline. 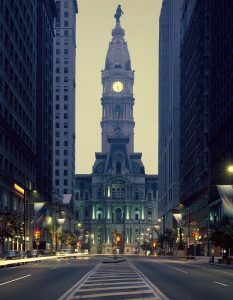 The central city reached new heights not only with the 548-foot tower of City Hall but also with the advent of skyscrapers, starting with the Land Title Building at Broad and Chestnut Streets (fifteen stories built 1897-98; twenty-two story addition built 1902). 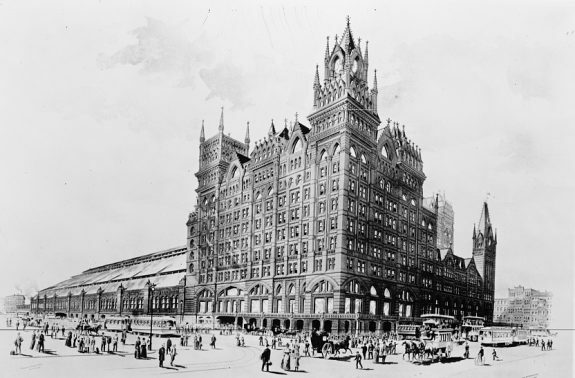 The combination of railroad stations, cultural institutions, department stores, and other businesses anchored Center City as a hub for commercial and cultural life, including conventions that filled Broad Street hotels. At the same time, a greater variety of residents gained the option of commuting from outlying areas on electrified streetcars (introduced in the 1890s), the Market-Frankford Subway-Elevated Line (built 1903-8, extended to Frankford in 1922), and the Broad Street Subway (1928-32). Motor vehicles added flexibility of travel and the option of driving to New Jersey over Philadelphia’s first bridge over the Delaware River, the Delaware River Bridge (opened in 1926 and renamed the Benjamin Franklin Bridge in 1955). As the region became more suburban from the late nineteenth into the twentieth century, Center City felt the impact. By the 1950s and 1960s, urban reformers focused their attention on areas of poverty and “blight” along the Delaware waterfront and in nearby neighborhoods. Pointing to areas that had “changed over the years from aesthetic assets to eyesores,” the Philadelphia Planning Commission led by Edmund Bacon (1910-2005), the Philadelphia Redevelopment Authority (established 1945), and the Olde Philadelphia Development Corporation (1956) spearheaded massive restructuring plans for Center City that involved redeveloping areas perceived as slums and adding infrastructure. Catering to car culture, highways created new boundaries and connections for Center City. Construction of I-95 along the Delaware waterfront in the 1960s linked Philadelphia to the Northeast Corridor but largely cut off the city from its formerly bustling harbor. On the other side of town, the Schuylkill Expressway reached completion in 1958. Planners also sought to improve movement of automobile traffic across the city with new expressways along the northern and southern boundaries of the old city proper. They succeeded in implementing the Vine Street Expressway, over strong opposition from residents of Chinatown, but could not overcome neighborhood resistance to a planned Crosstown Expressway along South Street. In Center City, redevelopment sought to compete with the appeal of suburbia with a new mix of residential, recreational, and commercial space, including high-rise apartment buildings and the suburban-style Gallery shopping mall on Market Street. West of City Hall, the Penn Center complex of office buildings rose in the corridor where an aging viaduct known as the “Chinese Wall” had carried trains into the old Broad Street Station. Around Independence Hall, historical parks managed by the state and federal governments replaced blocks of commercial buildings. 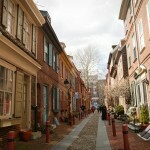 South of Independence Hall, by removing and resettling predominantly ethnic and poor residents, then preserving and restoring the best of their colonial-era homes, urban renewal transformed the old Jewish Quarter into upscale Society Hill. In addition to the urban pioneers who bought and rehabilitated the houses of Society Hill, residents added new vitality to other Center City neighborhoods, for example creating a “Gayborhood” in the vicinity of Thirteenth and Locust Street and an arts community in the abandoned factory lofts east of Third Street and north of Market. The continuing revitalization of Center City as a mix of residential and commercial historic ambiance and new development built upon these twentieth-century projects. Beginning in 1976, federal tax credits for historic preservation spurred creation of a new supply of luxury apartments through adaptive reuse of old hotels, factories, and office buildings. A boom in skyscraper construction west of Broad Street occurred after 1987, when One Liberty Place broke a longstanding but unofficial practice of respecting the William Penn statue atop City Hall as the highest point in the city. Other skyscrapers followed, with Comcast surpassing all others for height with its fifty-seven-story headquarters built in 2008 and again with its sixty-story Technology and Innovation Center built between 2014 and 2018. East of Market Street, after retailing suffered the failures and consolidations of department stores, the onetime showcase urban shopping mall, the Gallery, itself became the site of redevelopment into a retail-entertainment complex to be called Fashion District Philadelphia. In an era of industrial decline, Center City anchored a tourism industry that became increasingly important to the region’s economy. Promoters showcased the birthplace of a nation with museums and historic sites like Independence National Historical Park as well as yearly attractions such as the Mummers Parade, an abundance of public art, and a thriving dining and entertainment scene. To compete for conventions as well as recreational travelers, the Pennsylvania Convention Center opened in 1993, taking up the whole of four city blocks between Arch and Race Streets from Eleventh Street to Thirteenth (then more than doubling in square footage with an extension to Broad Street in the 2010s). Redevelopment in service to tourism also occurred in Independence National Historical Park, which gained a block-long visitor center, an expanded exhibit hall for the Liberty Bell, and the National Constitution Center, and nearby a Museum of the American Revolution. 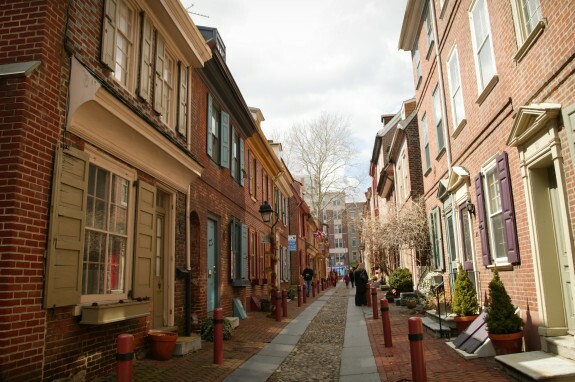 Stewards of Philadelphia’s Center City, like those in other American cities, grappled with the challenge of preserving the past while ensuring a secure future for the city and its residents. Beginning in 1991, the Center City District—a business improvement district—supplemented city services to improve quality of life with initiatives ranging from street cleaning to development of Dilworth Park adjacent to City Hall and Sister Cities Park on the Benjamin Franklin Parkway. By the early decades of the twenty-first century, new attention turned toward reintegrating the Delaware River waterfront into the urban grid, and the Schuylkill River Trail opened on the western edge of the original city plan. By 2017, an estimated 190,000 of Philadelphia’s 1.5 million residents lived in Center City and adjacent blocks north to Girard Avenue and south to Tasker Street, including a high concentration of young professionals and increasing numbers of older residents relocating from the suburbs. In a city of many neighborhoods, Center City remained a heart of political and cultural activity and a visible expression of Philadelphia’s growth and change—not only a geographic location, but a signpost of urban vitality. Catharine Dann Roeber is associate professor of decorative arts and material culture at the University of Delaware and the author of the PhD dissertation Building and Planting: Material Culture, Memory, and the Making of William Penn’s Pennsylvania, completed at the College of William and Mary in 2011. Charlene Mires is professor of history at Rutgers-Camden and editor-in-chief of The Encyclopedia of Greater Philadelphia. Braddock, Alan C. and Laura Turner Igoe, et.al. A Greene Country Towne: Philadelphia’s Ecology in the Cultural Imagination. State College: Penn State University Press, 2016. Cotter, John L. et.al. The Buried Past: An Archaeological History of Philadelphia. Philadelphia: University of Pennsylvania Press, 1993. Cutler, William W. III, and Howard Gillette Jr., eds. The Divided Metropolis: Social and Spatial Dimensions of Philadelphia, 1800-1975. Westport, Conn.: Greenwood Press, 1980. Gallery, John Andrew. 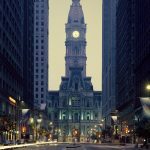 The Planning of Center City Philadelphia: From William Penn to the Present. Philadelphia: The Center for Architecture, 2007. Knowles, Scott Gabriel, ed. Imagining Philadelphia: Edmund Bacon and the Future of the City. Philadelphia: University of Pennsylvania Press, 2009. Miller, Frederic M., Morris J. Vogel, and Allen F. Davis. Still Philadelphia: A Photographic History. Philadelphia: Temple University Press, 1983. Milroy, Elizabeth. 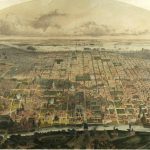 The Grid and the River: Philadelphia’s Green Places, 1682-1876. University Park, Pa.: Pennsylvania State University Press, 2016. Smith, Billy G. The “Lower Sort”: Philadelphia’s Laboring People, 1750-1800. Ithaca, N.Y.: Cornell University Press, 1990. Upton, Dell. Another City: Urban Life and Urban Spaces in the New American Republic. New Haven: Yale University Press, 2008. Webster, Richard. 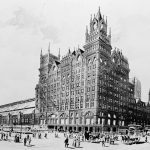 Philadelphia Preserved: Catalog of the Historic American Buildings Survey. Philadelphia: Temple University Press, 1976 (second edition, 1981). Wilson, Kathryn. Ethnic Renewal in Philadelphia’s Chinatown: Race, Place, and Struggle. Philadelphia: Temple University Press, 2015. Bacon, Edmund N. “Downtown Philadelphia: A Lesson in Design for Urban Growth” preprint from Architectural Record (May 1961). 15th Annual Report, Redevelopment Authority of the City of Philadelphia, 1960. Center City District. State of Center City 2018. Library Company of Philadelphia, Print and Photograph Department. 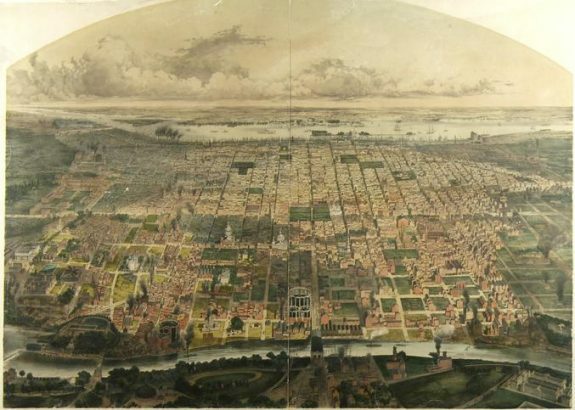 Center City Philadelphia in the 19th Century. Charleston, S.C.: Arcadia Publishing, 2006. OPDC | CPDC – 50 Years of Remaking Center City. Philadelphia: Central Philadelphia Development Corporation, 2006. Philadelphia City Planning Commission. Comprehensive Plan: The Physical Development Plan for the City of Philadelphia. Philadelphia, 1960. Spector, Gus. Center City Philadelphia. Charleston, S.C.: Arcadia Publishing, 2007. John Wanamaker Collection and Richardson Dilworth Papers, Historical Society of Pennsylvania, 1300 Locust Street, Philadelphia. Records of the Commissioners for the Erection of Public Buildings, Philadelphia City Planning Commission, Redevelopment Authority Records, and Fairmount Park Commission, Philadelphia City Archives, 548 Spring Garden Street, Philadelphia. Edmund Norwood Bacon Papers, Architectural Archives of the University of Pennsylvania, 102 Meyerson Hall, Philadelphia. Independence Hall Association Papers, Independence National Historical Park Library and Archives, Merchants Exchange Building, Third and Walnut Streets, Philadelphia. Center City Residents Association Records and Society Hill Civic Association Papers, Special Collections Research Center of Temple University Libraries, Samuel L. Paley Library, 1210 Polett Walk, Philadelphia. African American Museum in Philadelphia, 701 Arch Street, Philadelphia. City Hall, Market and Broad Streets, Philadelphia. Independence Seaport Museum / Penn’s Landing, 211 S. Christopher Columbus Boulevard, Philadelphia. Independence Visitor Center, Independence National Historic Park, Sixth and Market Streets, Philadelphia. Merchants Exchange (Independence National Historical Park headquarters), Third and Walnut Streets, Philadelphia. Squares of the original city plan: Northeast/Franklin (Sixth and Race Streets); Southeast/Washington (Sixth and Walnut Streets); Southwest/Rittenhouse (Eighteenth and Walnut); Northwest/Logan (Eighteenth and Race); Center/Penn (Broad and Market). Old City Hall, Fifth and Chestnut Streets, Philadelphia. Welcome Park, Second and Walnut Streets, Philadelphia. Catharine, thanks for the detailed history of Center City and its relationship to the other neighborhoods of Philadelphia proper – it’s a long and complicated story! I, too, have been fascinated by the use of the term “Center City,” which I have to explain to tourists. You’re right – after Consolidation, terms like “the central city,” or “centre city” came into use. 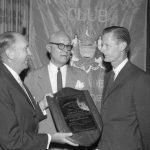 The first time I discovered Center City capitalized, in a formal title, was indeed in the name of the “Center City Residents Association,” which formed in September of 1946. Throughout most of the 1950s, “the central city” is the term most often used in official reports by the Philadelphia Redevelopment Authority (PRA) and the City Planning Commission. The PRA report for 1959, however, clearly uses the term “Center City” and from then on, that’s the term used almost exclusively by both the PRA and the Planning Commission. Since it wasn’t the most usual term for the downtown area before then, I do have to wonder if it was a conscious choice to adopt that term and, if so, who made that choice. Thank you so much for this! I’ve been trying to figure this out but couldn’t find this much detail in a single source. This is great.